I was fortunate enough to see B. B. King perform in 1997. Forty-six years after his first hit, at the age of 71, he was still an exciting musician and an engaging entertainer. It was one of those now increasingly rare occasions when the promoter matched the right artists together on the bill, with The Neville Brothers and Doctor John opening for King. My wife and I were seated close to center stage at the Saratoga Performing Arts Center, a beautiful amphitheater with great sound. B. B. was still standing for most of the concert and shaking and shouting better than many half his age. He was also still playing more than 250 nights a year at the time. His guitar playing was sublime. And as for his singing, not only was his phrasing impeccable, but his tone and timbre were still intact and his voice was as powerful as ever. This was surprising to me. To put this in perspective, I had already witnessed performances by icons of both the late 1950’s and the late 1960’s (younger than B. B.) in recent years which were downright depressing. If I could complain about anything it was that B. B. was too generous toward others. His band opened the set and even after he joined them he showcased his guitarist, trumpeter/bandleader, saxophonist, drummer, etc… They were all excellent musicians; however, I came to hear B. B. and not his band. I remember reading comments that in later years B. B. King would talk too much or ramble on in concert. My opinion is that while I would rather have heard him play more and talk a little less, at least he cared enough about his audience to engage with them and relate to them. He left you feeling like you had been spending time with a friend rather than like you had simply paid to see a show. My introduction to B. B. King came by way of FM underground or progressive rock radio, as it was called, in the early 1970’s. 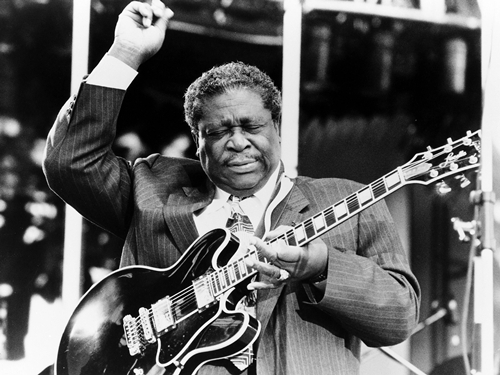 He was not the first Chicago blues guitarist I was exposed to, having already become familiar with Albert King, but B. B. certainly made a lasting impression on me. B. B. King had an outsized influence on rock music. He is often mentioned along with Eric Clapton however, even though they shared a long friendship, Clapton has said that he didn’t listen much to B. B. in his formative years. Instead, Eric was influenced by Freddie and Albert King, as well as Hubert Sumlin and Otis Rush. Although, it could be argued that out of that group, at least Rush’s playing owes a debt to B. B., one can surely trace players like Michael Bloomfield, Jimmy Page, Peter Green, Mick Taylor, Kim Simmonds, and Carlos Santana back to King. I would even include Jerry Garcia in that number. It is probably easier to name the rock guitarists of the 1960’s and 1970’s who were not influenced by King than vice versa. I remember reading an interview with Buddy Guy where he recalled being discouraged because early in his career critics would say that he was imitating B. B. King. He said that when he met B. B. and told him about it King told him not to worry and added that he also started by imitating someone else, except that by now nobody remembers who that person was. B. B. has actually always acknowledged his influences; Charlie Christian, Lonnie Johnson, Django Reinhardt, T-Bone Walker and his cousin Bukka White. You can easily detect these sources in his playing – he is not padding his resume like some modern players who cite influences whom they clearly sound nothing like, perhaps, thinking that doing so adds credibility. You can hear the raw passion and crying tone of Bukka White’s slide guitar and in the next phrase hear a sophisticated jazz-influenced line that would fit with Django or Charlie Christian. I also have always loved King’s use of dynamics. It has sometimes been said that the electric guitar lacks dynamics. I challenge anyone who says this to listen to B. B. as he could go from a very clean–toned whisper to a loud, impassioned roar at will (he also did this with his voice). This attention to subtlety seems to be lacking in much of the music (including blues music) I have heard produced recently. In 1997 I purchased a Gibson B. B. King Lucille. I can tell you that my wife has at times been jealous of her. She is a fine guitar produced at the time that Gibson made a return to high-quality instruments. I have never been able to approach the exquisite sound that B. B. was able to coax out of his various Lucilles. Nevertheless, I will keep trying. The Thrill Is Gone, indeed.